This remarkable 1,300-year-old archaeological wonder lies 130 miles northwest of Bernalillo in a remote canyon reached via a pair of rough county roads and four-lane US 550, which traverses some of the state’s least densely populated and most breathtaking high-desert terrain. The journey begins and ends in Bernalillo, where you can explore another of New Mexico’s carefully excavated Puebloan ruins at Coronado Historic Site, as well as the windswept grounds of Santa Ana Pueblo, where guests can ride horseback on ancient trails through the Jémez and Río Grande valleys. Late spring is an opportune time to visit Chaco Culture National Historical Park, as the longer days allow more hours for exploring the ruins, and typically dry May and June weather increases the likelihood of smooth driving conditions on the approach road to the park. 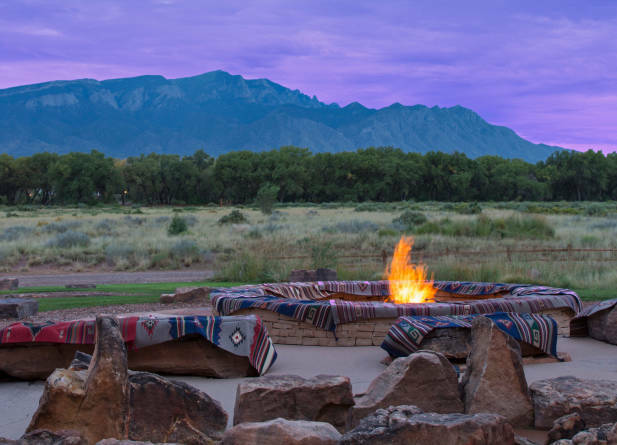 Spend your first day in Bernalillo, about 15 miles north of Albuquerque via I-25 and US 550, exploring Coronado Historic Site and riding horseback—or simply relaxing—at the Hyatt Regency Tamaya. Get an early start the next morning, driving NW on US 550 for 115 miles to Nageezi, turning left and continuing south 5 miles on CR 7900, and then SW for 16 miles on CR 7950 to Chaco Culture National Historical Park. From Bernalillo, the drive takes 21⁄2 to 3 hours and is passable in a standard car, but you’ll have an easier time in a higher-clearance four-wheel-drive vehicle, as most of CR 7950 is unpaved, and the last two or three miles can be rough, especially following rainy weather. Before setting out, call the park visitor center to get a report on the latest road conditions and to confirm the schedule for rangers’ free guided walks. After leaving the park, return the way you came, stopping for dinner or a possible overnight in tiny Cuba, halfway between the park and Bernalillo. Start the day with a delectable breakfast at the colorful Range Cafe, which is as well-known for its gift shop—stocked with kitschy curios and local artwork—as for its inventively prepared comfort fare, from country-fried steak and eggs with green chile gravy to blue corn pancakes packed with blueberries and topped with fresh fruit. Many of the Tiwa people now residing in the Isleta, Sandia, Picuris, and Taos communities are descended from inhabitants of the Kuaua settlement (c. early 1300s–late 1500s), preserved at Coronado Historic Site. Here at this carefully restored state monument, near the west bank of the Río Grande, you can walk among the adobe walls and square kiva excavated by archaeologists in the 1930s and view pre-contact murals displayed inside the Pueblo Revival visitor center, designed in 1940 by John Gaw Meem. (Read more about the renovation at mynm.us/coronadosite.) A party led by Spanish conquistador Francisco Vásquez de Coronado invaded Kuaua in 1540 as part of New Spain’s attempts to locate the fabled Seven Cities of Gold. The nearby Hyatt Regency Tamaya Resort & Spa makes an enjoyable stop even if you’re not spending the night. The resort’s Stables at Tamaya offer 90-minute trail rides through the cottonwood-shaded, sagebrush-carpeted terrain of Santa Ana Pueblo, which has been home to the Tamayame people for centuries. You can also attend traditional horno bread-baking demonstrations and flute and dance performances in the hotel’s courtyard. Opportunities for mingling abound at a pair of decades-old institutions on Bernalillo’s main drag. Abuelita’s, which honors grandmotherly home cooking with a sweet photo display of customers’ own abuelitas, serves classic New Mexican favorites like slow-roasted carne adovada, handmade red chile tamales, and the house specialty, the “tacopilla”—a hubcab-size sopaipilla stuffed with beans, lettuce, sour cream, guacamole, shredded beef or chicken, and chiles and then folded like a taco. A few blocks away, the dedicated curbside motorcycle parking outside Silva’s Saloon hints at the fun-loving clientele who frequent this watering hole that’s been dispensing strong drinks since it opened, hours after the repeal of Prohibition in 1933 (and quite possibly before). The walls and ceiling beams are festooned with cowboy hats, signed dollar bills, and Great Depression–era liquor bottles. Set on a secluded 500-acre tract near the confluence of the Jémez River and the Río Grande, the gleaming Hyatt Regency Tamaya Resort & Spa offers a menu of diversions and creature comforts that rival any resort in the state: world-class golfing on the Gary Panks–designed Twin Warriors course, prickly-pear toning treatments and blue-cornmeal-pumpkin- seed scrubs at Tamaya Mist Spa, plus first-rate dining and poolside relaxation. The spacious rooms all have patios and balconies, and many overlook the Sandía Mountains. If it’s just a comfy and clean room you’re seeking, note that Bernalillo has several mid-priced chain options along US 550, just off I-25. Upon reaching Chaco Culture National Historical Park, stop by the visitor center to watch a 25-minute film, which provides an engrossing overview of the site and its remarkable significance as the center—from roughly the late 800s through the early 1200s—of a vast Southwest trade network that extended for hundreds of miles. Within the park, you can visit about a dozen major ruins, some of them located less than 100 feet from the paved park loop road and others requiring easy to moderately challenging hikes of three to seven miles. How many ruins you visit in one afternoon depends on when you arrive (the sites are open daily until sunset), but in as little as two hours, you can thoroughly explore Chaco’s most extensive “great houses,” Pueblo Bonito and Chetro Ketl, which are themselves connected via a short trail that hugs the base of a dramatic sandstone cliff. The path through Pueblo Bonito, which once contained more than 600 rooms and rose to four stories, leads over this massive compound’s northern rampart and through a central plaza containing several massive sunken kivas before continuing through a maze of ground-floor rooms. Be prepared to crouch in order to fit through some very low doorways. As you walk among these ruins, which have been partially reconstructed, note the sophisticated tabular-sandstone-block-and-plaster masonry, echoed by the Hyatt Regency Tamaya’s interior wall. If you have extra time, make the two-hour round-trip hike to the Pueblo Alto Complex, which climbs about 270 feet to the top of a sandstone mesa along Chaco Canyon’s northern rim. The trail affords bird’s-eye views of Pueblo Bonito and Chetro Ketl and accesses the solitary and serene Pueblo Alto and New Alto ruins. In less than an hour, you can also easily walk the one-mile Petroglyph Trail to the Una Vida great house, a nice example of a dig that’s been minimally excavated and thus provides a sense of how Chaco’s other ruins appeared prior to their often extensive repairs and restorations. Easily the most popular dinner option between Bernalillo and Chaco, El Bruno’s Restaurante occupies a rambling adobe compound in Cuba. Since 1975, this festive restaurant with rustic beam ceilings and equipale furniture has been dispensing hearty, delicious regional fare: piñon-crusted rainbow trout, carnitas con papitas, and a smoky, pork-flecked green chile stew—cooked with Hatch green chiles roasted on the premises each September—that rightly ranks among the best in the state. In addition to an extensive list of wines and top-notch margaritas, El Bruno’s carries several New Mexico craft beers. Accommodations near Chaco are few, and we recommend the park’s designated campsites, which are famous for stargazing. Other options include Cuba’s scenic and charming Sueños Encantados y Casa Vieja Bed & Breakfast or the clean and affordable Frontier Motel, an old-school motor court with an endearingly gaudy sign and a friendly staff. It’s a little less than 90 minutes’ drive from the park. You could also return to Bernalillo or nearby Albuquerque or continue north on US 550 about 75 miles to Farmington.